Playing along with Less is More's sketch this week. 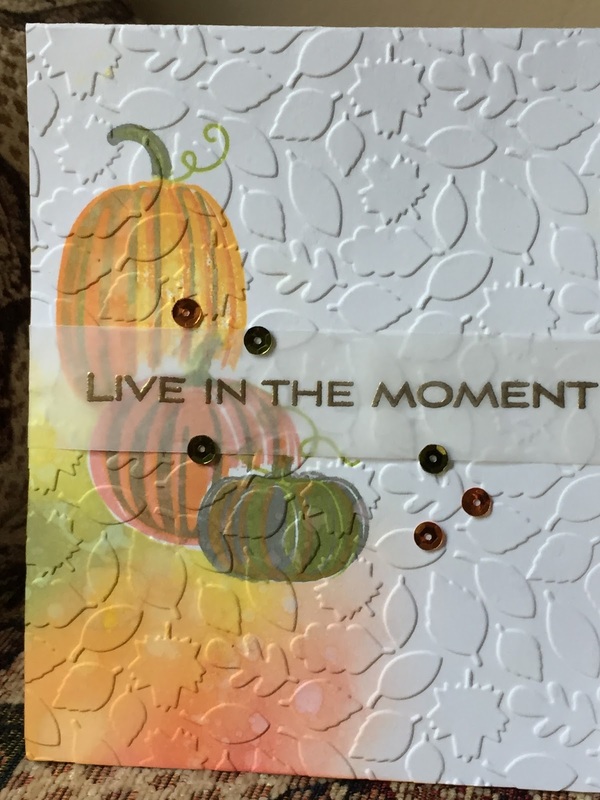 I used Sunny Studio's Pretty Pumpkins layering set with both distress oxide and Gina K inks for a variety of colors. I masked the individual pumpkins to arrange them behind each other, then dry embossed the front of the card. The sentiment is from Altenew. I stamped it on vellum with versamark then heat embossed with gold embossing powder, adding a few little sequins for bling. Thanks for looking! Great techniques here, I love your masking and use of inks, what a beautiful fall card! The embossing folder you've used is maybe a bit busy for our clean and simple challenge -we like to see some completely empty space somewhere in the card and since this folder textures the whole base quite heavily it's slightly non-CAS -I do love it though and the look of your card! We actually just discussed with the team how to use embossing folders in a clean and simple way -it's tricky because we all love them and want to use them, it's just the "empty space"-thing that becomes challenging with them! So don't worry about it and lovely to see your beautiful card in the gallery! Thanks for joining us at Less Is More! Thank you so much for your feedback, Nonni! I have to admit that this wasn't my original design for the challenge, but because I was rushing at the last minute...well, you can guess the rest. Someday I may learn, lol! Seriously, I appreciate what I'm learning from all of you at LIM. Now I feel challenged to play with embossing folders in a truly CAS way! Beautiful card Kathy ! These pumpkins are great such as the fall colours you chose ! A fabulous masking work here ! I know what you feel about EF, that's why I barely use them now for our challenge ! But I still love them ! Anyway, thank you for sharing and for playing along at Less is More this week, and I hope we will see you next week with our new challenge ! Just reading your reply to Nonni and I'm pleased we are challenging you, that's what these challenges are all about. I love your card and I love embossing folders too. I have a couple I use as subtle backgrounds and the rest I need to try to use in a more CAS way. It's challenging all of us so you're not alone! :) There are so many lovely products out there, but we love to stay true to our CAS guidelines at LIM. Terrific cards! I struggled with this challenge, but you have many great ideas! Thanks for being our guest!